Click Here To Download THE REALMS... REALM 1: I'MA RISE, Now! The forging of visual lyrics that are both thought provoking and motivational with unsuspected sounds build the framework for the eclectic style of Montshodaw. The purpose embodied in his music is unlike mainstream rap and is expressed in ways that often intermingle and expand beyond genre boundaries. His art is gritty, conscientious, and carries an intent to inspire contemplation and enjoyment. The Realms... Realm 1 is a powerful synthesis of bold ideas and dynamic instrumentation that is daringly graphic, robust, and seductive. 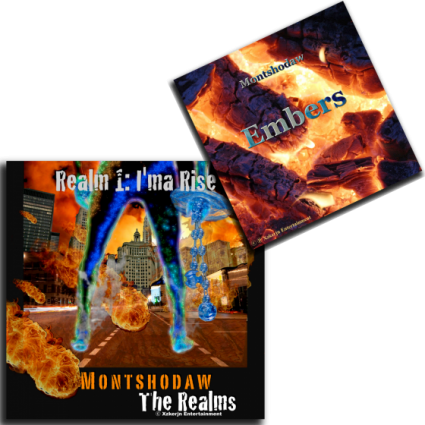 If you enjoy Montshodaw’s music and have been considering picking up a copy of THE REALMS…REALM 1… Now is the time. You will receive a digital download of The Realms... Realm 1: I'ma Rise via email, immediately after placing your order.